That means 4.12 percent of the labor force have been jobless for at least half a year, and that doesn't even include the millions of discouraged workers who have stopped looking altogether. 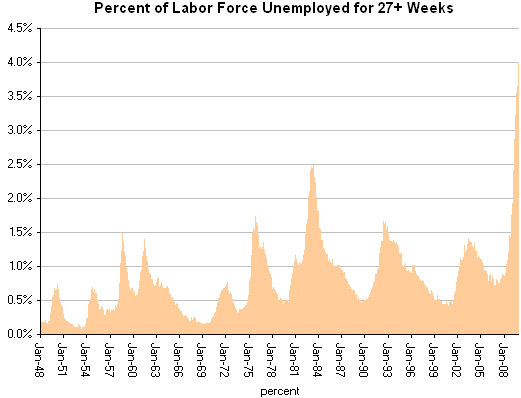 One explanation for this recession's extended unemployment is that we're also seeing the largest numbers of permanent layoffs ever -- those are jobs that disappear and never come back for rehiring, like auto workers, or clerical worker, or (gulp) newspaper reporters. 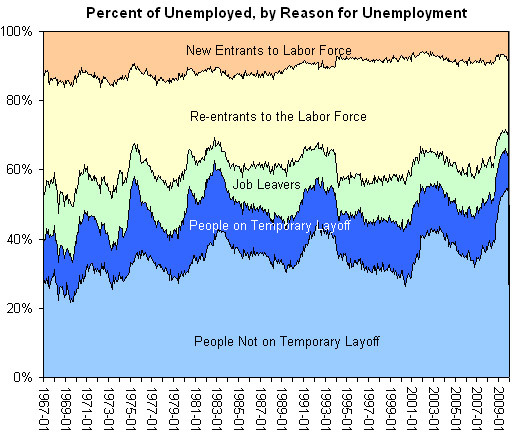 For the first time ever, permanent job losses account for more than 50 percent of the unemployed. Getting these people back to work will require something more than companies returning to their pre-recession profitability. It will require new companies, new industries, new areas to invest. Twelve months ago, I would have pointed to green technology, but without a carbon price to advantage wind, solar and other alternative energies, I don't know that green jobs will thrive merely on the back of government subsidies and weatherization tax credits. The White House expects that jobs will continue to come mostly from health care, education, and government. If we don't add another industry to that trinity, we're looking at a long, long job slog. Update! This is a perfect opportunity to plug Don Peck's new cover story for The Atlantic: How a New Jobless Era Will Transform America.